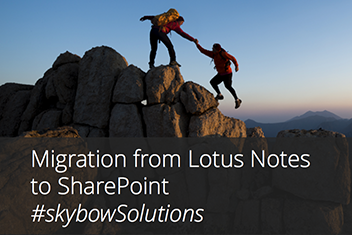 Migration from Lotus Notes to SharePoint - easy with skybow - Part 1. A lot of enterprises are facing the challenge of phasing out legacy Lotus Notes installations. The first choice in that replacement, and the most recommended choice, is Microsoft’s SharePoint Server. SharePoint Server offers all required functionalities expected by former Lotus Notes users: easy collaboration, content creation, and even the features that were not so easy to achieve with Lotus Notes, such as Enterprise Content Management, Business Process Management, etc. Even with all the advantages of SharePoint, there has always been one obstacle in Lotus Notes migration to SharePoint: custom solutions built on Lotus Notes. After implementing Lotus Notes, enterprises were usually implementing business solutions on top of it. A typical solution, often used as a token example, is the “Request for leave” solution, which enables employees to request a leave, holiday, or any other absence that then must be approved or rejected by their superiors and HR. Even if it sounds simple, such a solution has a lot of facets: the request for leave process varies just enough from company to company that a generic solution wouldn’t work. In Lotus Notes, development of such solutions was made fairly easy by combining different elements. SharePoint, on the other hand, does offer all the bits and pieces that companies need to create such solutions, and many more: lists and document libraries for data entry and storage, web parts, event receivers, and timer jobs for data processing. But creating such solutions on top of SharePoint is a costly job, which involves skilled software developers and the complete software development cycle. forward process, which can be implemented by functional consultants, without (or with minimal) involvement of developers. This drastically decreases the time needed for development of such solutions (up to 85%), and makes a Lotus Notes to SharePoint Server migration a much easier and more straightforward process. In the next few chapters, we will give you a high-level overview of the development of a sample “Request for Leave” solution, and how it can be easily migrated from Lotus Notes.